Recording charts are to be found supporting every aspect of our daily lives, education, industry, medicine which all rely on records on our paper. Oil drilling, refining, chemical industry etc. require accurate records of flow, temperature & pressure to be maintained at all times not only to ensure quality but also safety. The results obtained in industry, medicine & science are recorded on our charts & specialty printer papers. With over 50 years of experience we are confident that we are able to manufacture for every type of application. We have the technical expertise & skills needed to produce charts accurately & economically. We pride ourselves on our ability to tailor make recording charts for specific customer requirements. 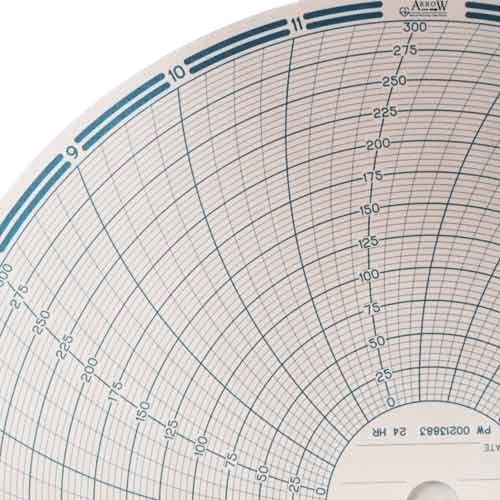 Included in our range of rolls, fanfold, circular & sheet recording charts are all paper types including ink-writing, heat sensitive, pressure sensitive & electro sensitive. These chart fit all the recorders in use some of which are:- Yokogawa, Chessel, Eurotherm, Foxboro, Honeywell, ABB/Kent/Taylor, Dickson, Leeds & Northup, Chino, Bailey, Camille Bauer, Fuji to name a few. Charts available to fit every type of recorders. Accurately printed on top quality recording paper. Produced to meet customer’s specific requirements.